It should come as no surprise that when Gallup recently conducted a poll asking residents to rank if their state is the "worst possible to live in" a whopping 25% of its residents, by far the most of any states, responded Illinois. Which were the other "worst possible" states? The table below ranks them all. 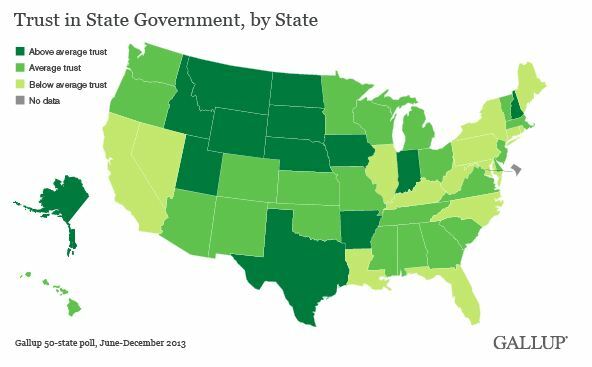 States where residents trust their STATE (not federal) government. Tells you how well the states are run! How about the opposite: the best US states to live in? Here is the full list in descending order. 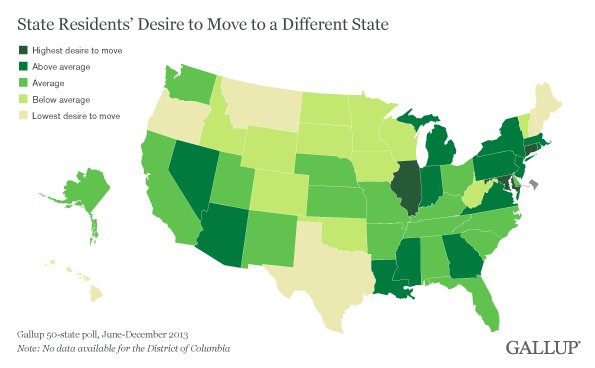 Residents of Western and Midwestern states are generally more positive about their states as places to live. With the exception of the New England states of New Hampshire and Vermont, all of the top 10 rated states are west of the Mississippi River. In addition to Montana and Alaska, Utah (70%), Wyoming (69%), and Colorado (65%) are among the 10 states that residents are most likely to say their state is among the best places to reside. Most of these states have relatively low populations, including Wyoming, Vermont, North Dakota, and Alaska -- the four states with the smallest populations in the nation. Texas, the second most populated state, is the major exception to this population relationship. Although it is difficult to discern what the causal relationship is between terrain and climate and positive attitudes, many of the top 10 states are mountainous with cold winters. In fact, the two states most highly rated by their residents -- Montana and Alaska -- are among not only the nation's coldest states but also both border Canada. With the exception of New Mexico, all of the bottom 10 states are either east of the Mississippi River or border it (Louisiana and Missouri). New Jersey (28%), Maryland (29%), and Connecticut (31%) join Rhode Island among the bottom 10. The results are based on a special 50-state Gallup poll conducted June-December 2013, including interviews with at least 600 residents in every state. For the first time, Gallup measured whether residents view their states as "the best possible state to live in," "one of the best possible states to live in," "as good a state as any to live in," or "the worst possible state to live in." Few Americans say their states are the single best or worst places to live. Rather, the large majority of respondents say their states were either "one of the best" or "as good a state as any" place to live. Illinois has the unfortunate distinction of being the state with the highest percentage of residents who say it is the worst possible place to live. One in four Illinois residents (25%) say the state is the worst place to live, followed by 17% each in Rhode Island and Connecticut. Throughout its history, Illinois has been rocked by high-profile scandals, investigations, and resignations from Chicago to Springfield and elsewhere throughout the state. Such scandals may explain why Illinois residents have the least trust in their state government across all 50 states. Additionally, they are among the most resentful about the amount they pay in state taxes. These factors may contribute to an overall low morale for the state's residents. Although Texas trails Montana and Alaska in terms of its residents rating it as the best or one of the best places to live, it edges out Alaska (27%) and Hawaii (25%) in the percentage of residents who rate it as the single best place to live. Texans' pride for their state as the single best place to live is not surprising when viewed in the context of other measures. According to Gallup Daily tracking for 2013, Texans rank high on standard of living and trust in their state government, and they are less negative than others are about the state taxes they pay. The same is true for Alaska and, to a lesser extent, Hawaii, which had relatively average scores for trust in state government and state taxes, but ranked high for standard of living. The three also have distinct histories, geographies, natural resources, and environmental features that may contribute to residents' personal enjoyment and pride in their locale. Residents with the most pride in their state as a place to live generally boast a greater standard of living, higher trust in state government, and less resentment toward the amount they pay in state taxes. However, the factors that residents use to determine whether their state is a great place to live are not always obvious. West Virginia, for example, falls far behind all other states on a variety of metrics, including economic confidence, well-being, standard of living, and stress levels. Still, over a third of West Virginians feel their state is among the best places to live, giving it a ranking near the middle of the pack.